Huge selection of America’s Best air baths providing a non aggressive soft tissue massage using millions of heated air bubbles being released through air injectors into the water. An air bath massage soothes the body, boosts cardio output, opens pores and improves circulation. All of our air baths have a Lifetime Warranty on the blowers. A luxurious acrylic air bath. It is the ultimate air tub for restricted spaces, perfect for replacing a standard one piece tub/shower found in most homes. The rectangular shape can easily be incorporated into a shower design. 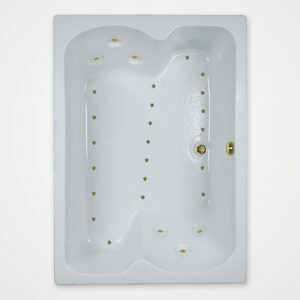 The extra deep bathing area is unmatched by any other air bathtub of the same dimensions. A beautiful air bath for the smallest of spaces. Watertech also manufactures two other models with different features so the homeowner can purchase the air bath best suited for their needs: the 6032BW and 6032 Elite. All Watertech 6032 models are rectangular in shape, perfect for those who want to add a shower over the air bath. our inches wider than standard tub/shower combinations found in many homes. A great air bath suited for narrow spaces. One person air tub unlike other manufacturers. We place 3 air jets to massage the back and 17 air jets in the floor of this jacuzzi style air bath to massage the rest of the body.. The top deck has two sculptured areas to hold soap, shampoo, conditioner, etc. The rectangular shape is perfect for those wanting to incorporate a shower over the air bath. The air bath has 28 watertight air injectors with 196 airports, which insure water never enters any part of the air system. 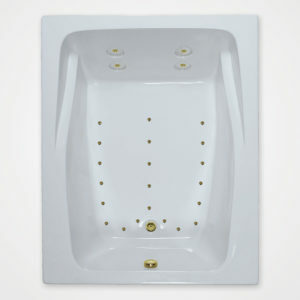 Four inches wider than a standard bath/shower one piece fiberglass unit. 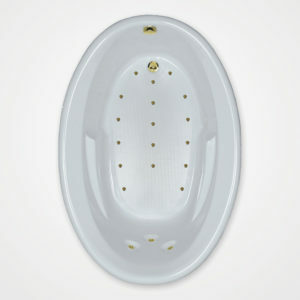 This a great one person air bath with a rectangular shape that can be easily incorporated into a shower design. 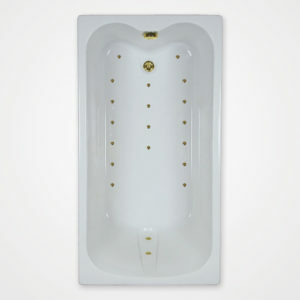 The extra deep bathing area is unmatched by any other air bathtub with 2 comfortable arm rests and 5 recessed air jets to massage the bathers back make this bath the premier bath of its size. A popular single person Elite air bath. 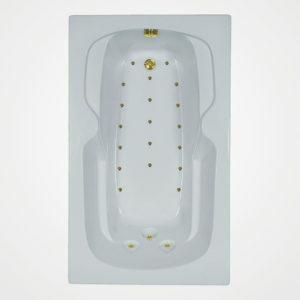 Extremely large bathing area with extra leg room, which is the result of the gently curved foot area of the air bathtub. The rectangular shape allows it to be incorporated into a shower design. For your comfort all back jets are recessed. 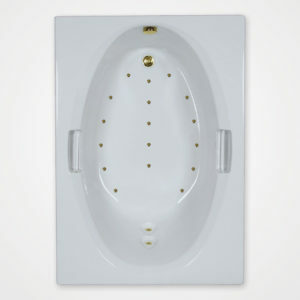 This elegant jetted bathtub’s oval shape is 60” long and 42” wide at its widest point. 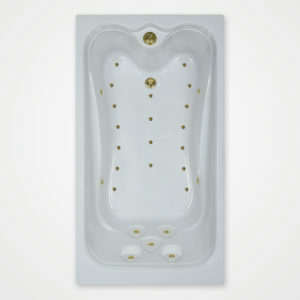 This one person air bath was designed to be deeper than most other jacuzzi style bathtubs the same size and shape. An inward sloping deck highlights the air tubs flowing ambiance. For your comfort there are sculptured arm rest designed into the tub. A very popular jacuzzi style one person air bath. Watertech also offers 3 other 60”L x 42”W air baths: 6042 Elite, 6042 EOW, 6042SW. The 6042GW has two clear acrylic grab rails designed into the air bath that are 1” in diameter and 9” in length, perfect for individuals that may desire some assistance getting in or out of the bathtub. A large deck area provides space for a faucet, soap, shampoo etc. 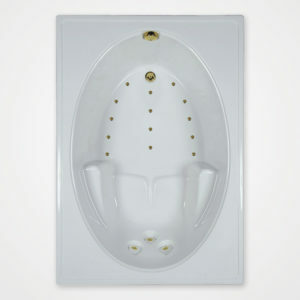 Wide tapered arm rests and a sculptured seating area in the floor of the tub, cradle your body. A 5’ bathtub for one person with a large deck area where a faucet can be installed. 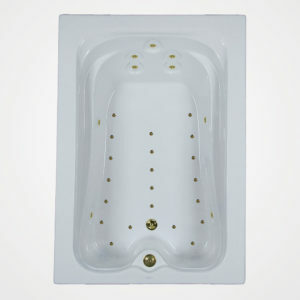 This air bath has a rectangular shape allowing a shower to be incorporated over the air bath, if desired. The air bath has 17 watertight air injectors with 119 airports, which insure water never enters any part of the air system. By adding 1” to the width of a 60”x42” bathtub, we have created a very popular 60x43 two person air bath that doesn’t require excessive width in the bathroom. By narrowing the tubs top deck, we created more internal bathing width and leg room for two people to relax comfortably sitting face to face. The tubs side drain location insures neither bather will be sitting on the drain. For those who would like to include a shower, this tub has the flexibility of installing a shower over its rectangular shape. This classic design accommodates two bathers sitting side by side. 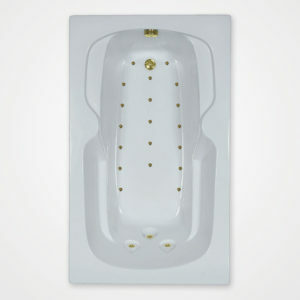 Dual stacked back jets and sculptured arm rests are amenities that provide comfort to each bather. For those wanting a shower over the air bath, this tubs rectangular shape makes it easy to include a shower in its design. The air bath has 28 watertight air injectors with 196 airports, which insure water never enters any part of the air system.